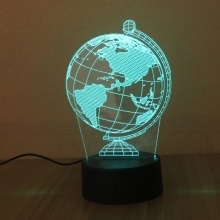 This 3D decorative light can create gorgeous, vivid lighting for your home, party with its 3D effect. Moreover, it&apos;s user-friendly and eye protected without flash and UV or IR radiation. With it, you can possess your colorful life. SPLENDID 3D EFFECT LIGHTS: unlike traditional incandescent bulb, this light casts colorful 3D light effect, which can bring gorgeous visual effects to your home, party etc. EXCELLENT DECORATIVE LAMP: with superb LED bead, it can be an ideal choice for decorating indoor places as you like, adding color for your life. ATTRACTIVE LIGHTING EFFECT & TO-UCH CONTROL: you can set up one of your most favourite color by touching or you can change light colors, long press for turning on/off. FLEXIBLE REMOTE CONTROL: You can use the provided remote control to adjust its brightness, 16 colors changing and experience 4 different lighting effect (flash/ strobe/ fade/ smooth), meeting your different needs under different circumatances. EYE PROTECTED & ENVIRONMENTAL FRIENDLY: no UV or IR radiation, no flash and electronic noise, it&apos;s user-friendly and eye protected, avoiding damage from radiation, visual fatigue and glare. EASY TO INSTALL: Mini size and light weight makes it carry easily. Be convenient to install, no more tools. APPLICATION SCENE: it can be widely used in home, cafe, bar, party, club, show room, ornament store, etc.